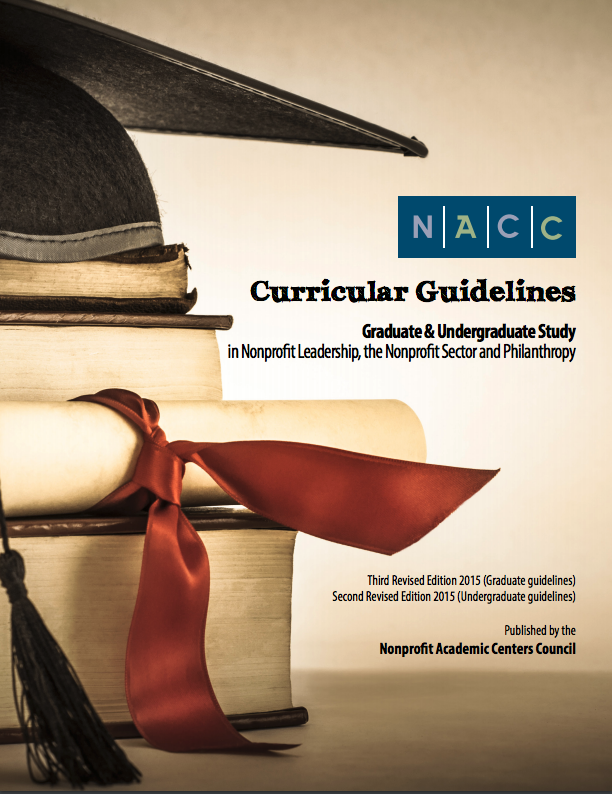 NACC Curricular Guidelines provide model curriculum for degrees in nonprofit leadership, nonprofit organization management, nonprofit sector studies and philanthropy. As the fast-evolving field of nonprofit and philanthropy pedagogy deepens and the institutional delivery knowledge diversifies, our vision is that the academy and the field of nonprofit sector practice will innovate using the curricular topics and framework provided in the NACC Curricular Guidelines. In reflecting on NACC’s dual mission of serving its members and advancing the field, it is clear to the organization’s leadership that the value of the curricular guidelines is indisputable; the need to update the documents, and revise them is essential as the fields of study continue to evolve. To that end, NACC is once again embarking on a “Curriculum Revision Project,” with Robert Ashcraft of Arizona State University spearheading the effort. As with past efforts in revising the guidelines, this Fourth Revised Edition 2019 (Graduate guidelines) and Third Revised Edition 2019 (Undergraduate guidelines) will utilize a crowd-source process. Guided by the NACC Board of Directors, widespread input will be sought from informed academics and practitioners through a web-platform and survey. The formal study of the nonprofit sector, philanthropy, private organizations of civil society and the institutions of voluntarism around the globe has surpassed its fifth decade. Throughout these years, the steady march toward an independent field of pedagogy has given us a string of important benchmarks. These include the founding of NACC in the early 1990s, and NACC’s creation of the original set of curricular guidelines for graduate and undergraduate study in nonprofit leadership, the nonprofit sector and philanthropy. Building upon the work of the early and middle 2000s, input for these guidelines included the NACC constellation of institutional members, but also involved input from a much broader community of theory and practice experts. This third revision of the graduate curricular guidelines and this second revision of the undergraduate curricular guidelines reflect the cumulative pedagogy of formal and informal learning contributed by our members and the larger sphere of nonprofit sector stakeholders. Among the salient changes in both the graduate and undergraduate guidelines are topical categories involving the expansion of technology in the field and in course delivery, more pronounced global and international perspectives, an accentuation of social innovation and social enterprise content areas, to name a few. As the fast evolving field of nonprofit and philanthropy pedagogy deepens and the institutional delivery knowledge diversifies, our vision is that the academy and the field of nonprofit sector practice will innovate using the curricular topics and framework provided in these guidelines. From the benefit of experience drawn from multiple iterations of NACC’s curricular guidelines, we urge users in the U.S. and around the world, to approach these revisions as guidelines to help in the development of courses, programs and degrees. Clearly, for those of us who study, teach, perform research and work in the nonprofit sector, the benchmarks offer indication that the time for a “nonprofit/philanthropy first” perspective of the discipline is upon us. To that end, we hope you will find the guidelines useful in your work. Please continue to assist us through broad dissemination of these guidelines and by helping to inform future guidelines. We anticipate more frequent revisions of these guidelines made possible through real-time opportunities to share your recommendations through a NACC web portal developed for such a purpose. NACC is a membership association comprised of academic centers and/or programs at accredited colleges and universities that are devoted to the study of the nonprofit/nongovernmental sector, philanthropy and voluntary action to advance education, research, and practice that increase the nonprofit sector’s ability to enhance civic engagement, democracy, and human welfare. Given its mission, it is appropriate that NACC’s leaders have continued to advance comprehensive curricular guidelines to assist its members and build the field. NACC’s leadership in developing and disseminating curricular guidelines began in 2001, made possible thanks to the generous financial support of the David and Lucile Packard Foundation. As a result of extensive discussions from a variety of scholars and practitioners, led by a NACC appointed task force, the first-ever graduate guidelines were released in 2003. The initial graduate guidelines were immediately well received and prompted a call for NACC to continue evolving such guidelines to include not only subsequent revisions of the graduate document, but also for the development of undergraduate guidelines. Again, a task force was appointed and, in 2007, the second edition of the graduate guidelines and the first edition of undergraduate guidelines were released. As before, the documents were well received and their release coincided with the continued explosive growth of nonprofit education programs around the United States and across the world. In evaluating NACC’s dual mission of serving its members and advancing the field(s) it was clear to the organization’s leadership in 2013–2104, that the value of the curricular guidelines is indisputable; the need to update the documents, and revise them is essential as the fields of study continue to evolve. To that end, NACC’s board authorized a “Curriculum Revision Project” and Robert Ashcraft of Arizona State University, was recruited to chair the effort. Unlike prior methods used for developing and revising the guidelines, involving a defined task force assembled for such purposes, this most recent effort utilized a crowd-source process. Guided by the NACC Board of Directors, widespread input was sought from informed academics and practitioners through a web-platform and survey, launched in August 2014. In edition, input was solicited through special NACC sessions established at the Association for Research on Nonprofit Organizations and Voluntary Action (ARNOVA, arnova.org) and the International Society for Third-Sector Research (ISTR, istr.org) conferences held during the 2013 and 2014 years, respectively. Following a vetting and review process, NACC’s board adopted the revised guidelines at its board meeting in June 2015. Since its beginning in 1991, NACC remains steadfast in its support of centers and programs that provide education and research about, and academically based services for, the nonprofit/nongovernmental sector and philanthropy. NACC’s desire is for these curricular guidelines to be actively used as academic programs continue to evolve.